James Wilson, shown here as a Major General. John Buford, Wesley Merritt, George Bayard, Thomas C. Devin. These are but a few of the names that more often than not come to mind when one thinks of the premier Union cavarymen of the Civil War. Certainly more names could be added to the list, but absent from this group is James Harrison Wilson. Wilson seems to stay in the background. Indeed, it takes awhile, but Wilson will eventually grow on you. But why? Why is it that an officer who served in both the Eastern and Western armies and rise to the rank of Major General be so difficult for us to include in the aforementioned list of his brother horse soldiers? Wilson, a West Point graduate, began the war in the Topographical Engineers. He served in the expedition against Fort Pulaski and later as aide to Maj. Gen. George McClellan. In the fall of 1862, he was transferred to Maj. Gen. U.S. Grant’s staff. During the Vicksburg Campaign, Wilson served as Inspector General for the Army of the Tennessee. On October 30, 1863 he was promoted to the rank of Brigadier General. A favorite of Grant’s, Wilson was assigned to head the Cavalry Bureau in February 1864. When Judson Kilpatrick was transferred from the Army of the Potomac, Wilson was elevated to command it’s Third Cavalry Division. While Wilson had developed and refined his skills in administration and logistics, he was ill-prepared for field command. His inexperience soon reared its ugly head. In the opening movement of the spring campaign, Wilson failed to properly screen the Potomac army’s advance as it moved through the Wilderness. By leaving the Orange Turnpike uncovered, he effectively allowed elements of Gen. Robert E. Lee’s Army of Northern Virginia to surprise and bring the Federals to battle the following day. From a personal perspective, it is Wilson’s performance in the Wilderness that keeps him at arm’s length. One of the primary responsibilities of the mounted arm was to screen their army’s movements. But at the same time, one could point fingers at Wilson’s superiors. Such an important assignment should have been given to the more experienced Brig. Gen. David M. Gregg and his Second Cavalry Division. While Wilson surely is culpable, the blame must also be distributed to his immediate superior, Maj. Gen. Philip H. Sheridan. It certainly does not help Wilson’s case that a week after the Wilderness, during Sheridan’s Richmond Raid, that he nearly entangled the entire corps near the Richmond defenses at Meadow Bridge. Hard fighting by Brig. Gen. George Custer’s brigade broke through the Confederate lines and the cavalrymen were able to ride to safety. Sympathies toward Wilson begin to turn in the summer of 1864. With an understrength division that was hardly combat ready, Wilson, along with Brig. Gen. August Kautz was given the assignment of cutting the Southside Railroad. In what is known as the “Wilson-Kautz Raid”, the Union cavalry rode well west of Petersburg, tearing up and wrecking the rail line. After being turned back at the Battle of Staunton River Bridge, Wilson’s division was nearly cut off and surrounded by Confederate cavalry during their return trip. 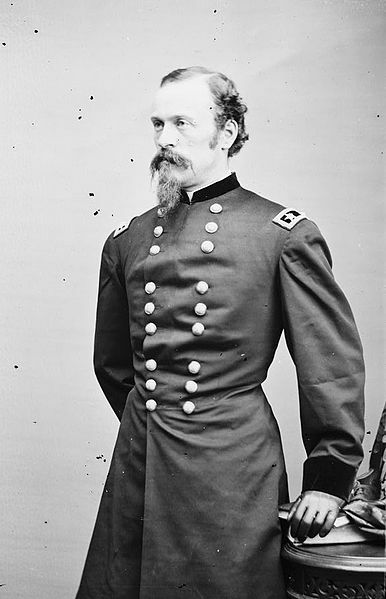 Wilson remained with the Army of the Potomac until the fall when he transferred back to the Western Theater to take command of the cavalry in Maj. Gen. William T. Sherman’s Military Division of the Mississippi. Wilson’s new assignment was certainly due more to his relationship with U.S. Grant than his performance. Wilson already possessed a knack for administration and logistics which he developed with the Cavalry Bureau. These skills would be put to good use as he reorganized Sherman’s cavalry. His combat experience in Virginia had also been invaluable. Wilson fought in the Tennessee Campaign and rendered superb service during the critical Battle of Nashville. The following spring, Wilson led his troopers on a massive raid into Alabama. He defeated Nathan Bedford Forrest at Selma and then turned west and rode into Georgia, reaching Macon on April 20, 1865. For his service, Wilson was made a Major General of Volunteers with the brevet rank in the Regular Army. After the war, Wilson briefly commanded the 35th U.S. Infantry. In 1870, he requested a discharge in favor of engineering duties as a civilian. He returned to active duty when war broke out with Spain in 1898 as a Major General and served in Cuba and Puerto Rico. Wilson also took part in the Boxer Rebellion before he was discharged in 1901. Wilson lived for another twenty four years before passing away in February 1925. By the end of the Civil War, Wilson had come into his own as a field commander. His service in Virginia was less than stellar, but it helped to shape and prepare him for his future operations. But whether Wilson could be considered a premier cavalryman remains to be seen. He certainly was one of the more effective mounted officers, especially in the latter stages of the conflict. What may—may mind you—set Wilson apart from his peers was his ability to manage supply and logistics. This is a prime illustration that more goes into being a combat officer that directing men on the battlefield. Quite possibly, Wilson was a much better administrator than field commander. The discussion, however, will surely go on. This entry was posted in Armies, Battles, Campaigns, Cavalry, Civil War Events, Leadership--Federal, Memory, Personalities, Western Theater and tagged Army of Northern Virignia, Army of the Potomac, August Kautz, Battle of the Wilderness, David M. Gregg, Fort Pulaski, George Bayard, George McClellan, James H. Wilson, John Buford, Meadow Bridge, Nathan Bedford Forrest, Philip Sheridan, Robert E. Lee, Second Cavalry Division, Tennessee Campaign, Third Cavalry Division, Thomas Devin, U.S. Grant, Vicksburg, Wesley Merritt, wilderness, Wilson-Kautz Raid. Bookmark the permalink. Thanks, Daniel Davis, for your pertinent information about Gen.James Wilson. Interesting that he lived and served in Spanish American War and Boxer Rebellion. I was especially interested to learn of his defeat of Gen. N. B. Forrest, as I am a native of Forrest County, Mississippi! We look forward to continuing interesting posts from you. Great post with interesting insight and information about Wilson. I did not know he was in service when the Boxer Rebellion broke out. I had an ancestor who was beheaded as a missionary in China. Be curious to read what Wilson has to say about that part of history. Thanks sir for sharing! Thank you Sir! To continue the conversation about the Boxer Rebellion, you may want to check out Wilson’s memoirs “Under the Old Flag”. Good quick review. Wilson was a fine manager, who knew how to equip cavalry and supply the largest cavalry formation ever assembled on the continent. He stumbled more often than not in the actions of the Virginia Overland campaign, and did a mediocre job during the fighting retreat of the Schofield’s forces toward Nashville. His accomplishment at Nashville was better, although not perfect. Yet in 1865 he used mis-direction, surprise, and speed to dominate the Confederate defenders in order to seize Selma before the scattered defenders could concentrate against his men. This final cavalry campaign of the war remains a model for deep strike in the age of tanks and attack helicopters. Wilson could learn, and could apply lessons of previous battles. Wilson’s performance in the Tennessee campaign against Hood was far below mediocre — it was awful. During my research on my book on Jacob Cox (Schofield’s deputy), I was startled and astonished to read Wilson’s comment at one point, after he had lost track of Forrest and let him get in between the cavalry and Schofield’s forces, to wit: “the enemy has disappeared” (!!) He eventually figured it out and helped stem Forrest’s flank attack at Franklin just before the charge into the strong defensive line Cox created. In my research, I learned that Wilson was involved in the arrest of Henry Wirz, commandant of Andersonville. Is this supported by your sources? Wilson testified on the military commission concerning the state in which he found the Andersonville camp during his expedition. He talks about it briefly in Vol. 2 of his memoirs, Under the Old Flag. Interesting to see Wilson and Wheeler serving together in the end.